The man shot dead Sunday at a home in a tiny Newfoundland community during a confrontation involving Premier Paul Davis's security pointed a gun at police shortly before the fatal shooting following a perceived Twitter threat, CBC News has learned. 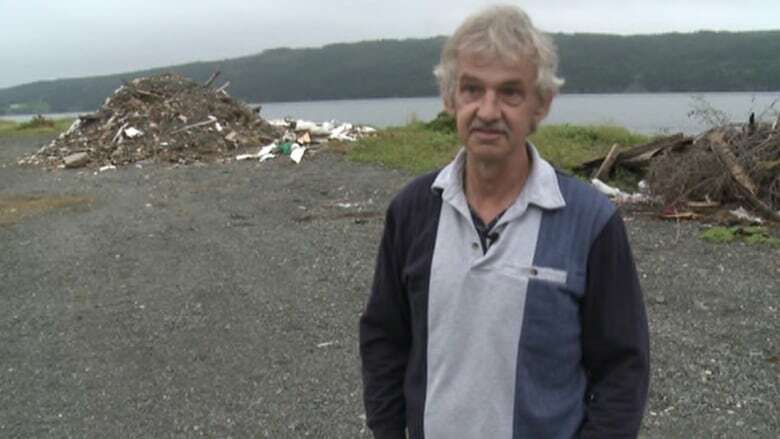 Sources say Don Dunphy, 59, had pointed a long gun at the Royal Newfoundland Constabulary (RNC) officer soon after he arrived at the man's house in Mitchells Brook, which is on Newfoundland's southern Avalon Peninsula. 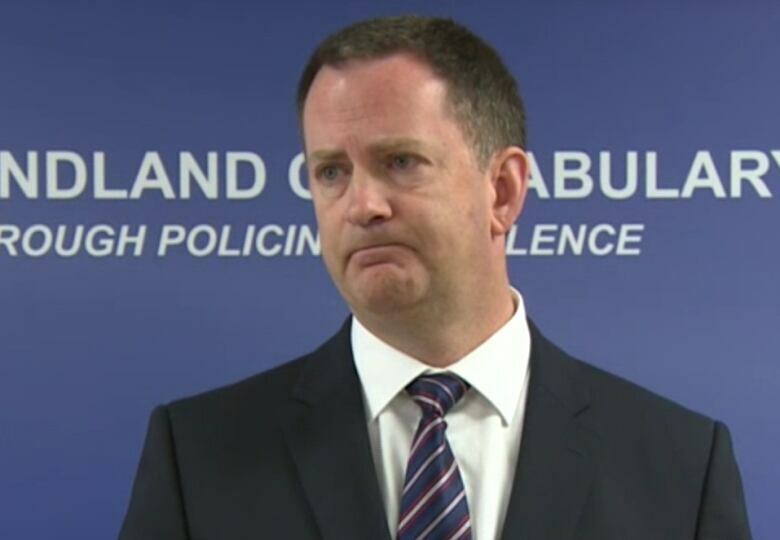 But RNC Chief Bill Janes on Monday refused to confirm that and other details of what happened at Dunphy's house, calling it evidence that would need to be assessed by the RCMP, which polices the rural area. An RNC officer had travelled to Dunphy's house on Sunday afternoon to investigate perceived threats, particularly a comment made on Twitter last week. Dunphy, who had frequently railed against authorities over how he was treated as an injured worker, had responded to an otherwise innocuous tweet that Child Youth and Family Services Minister Sandy Collins made about listening to music while travelling with Davis. "Won't mention names this time, 2 prick dead MHAs might have good family members I may hurt," Dunphy tweeted Friday, prompting an RNC officer to visit Dunphy's home. Dunphy was very active on Twitter, where his biography described him as "a crucified injured worker" in a province "where employers treat injured [workers] like criminals." Janes would not comment on what role Dunphy's Twitter activity may have played in the matter. "That would form part of the investigation, of what led the officer to the location, and I have to be careful to protect the integrity of the investigation and allow them to do their work," he told reporters. However, Davis told reporters Monday afternoon one of his staff members responsible for monitoring his Twitter accounts had alerted police to the tweet sent from Dunphy's account Friday. Davis said he was otherwise unaware of the situation until he was notified about the fatal shooting on Sunday. "I was shocked, deeply saddened yesterday to learn of the events that had taken place yesterday. This is a terrible tragedy for so many reasons. My thoughts and prayers today are with the Dunphy family." He added that the nature of the Twitter comments, which he said appeared to be directed at himself, another MHA and their respective families, was troubling. "It's upsetting when you see a comment made like that that appears to be directed toward me and another cabinet minister and the people most important to us, our families," Davis said. "They never put their hand up. I put my hand up and that's disconcerting. There's no two ways about it." Davis added he usually prefers to go places unaccompanied by security when he's not on official duty, and Sunday afternoon he and his wife spent the day at a hockey game without staff or security. However, he's not sure what, if any, changes need to be made. "I can tell you that the RCMP and RNC have had numerous discussions with me about that, and my wife as well, and it's something we've got to give very serious consideration to," Davis said. "I think it's fair to say we're in a very different time today than we were a number of years ago." Neighbours told CBC News that they heard multiple gunshots during the incident Sunday. It is not yet clear whether Dunphy ever fired his weapon, and Janes refused on Monday to confirm which weapons were fired. Forensics experts remained on the scene Monday afternoon collecting evidence, the RCMP said in a statement. RCMP said the autopsy on Dunphy will be performed Tuesday. The RNC officer involved in the fatal incident is assigned to the Constabulary's protective services unit, which has long provided security for Newfoundland and Labrador's premiers. Davis, who became premier last fall, happens to be a former RNC officer himself. His chief of staff, Joe Browne, is a former chief of the RNC, a provincial force that polices urban areas in Newfoundland and Labrador. The RCMP, which polices rural areas in the province, is investigating the incident, but is releasing few details on what may have happened on Sunday afternoon.